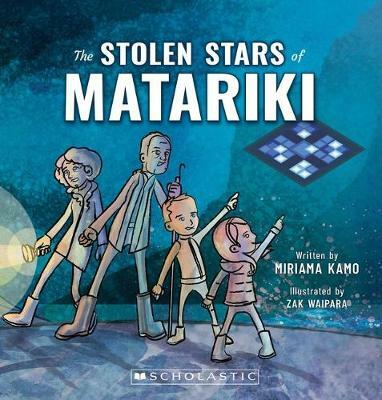 When Grandma and Poua take the children eeling one magical and wild starry night, they discover two stars missing from the Matariki cluster. Have the patupaiarehe been up to mischief again? This hauntingly beautiful debut story by award-winning journalist Miriama Kamo is brought ... read full description below. Behind dusty orange hills, where the sky stretches down to the sea, theres a magical, wild, windy place called Te Mata Hapuku. Sam and Te Rerehua love to visit their Grandma and Poua at Te Mata Hapuku (aka Birdlings Flat). They like to collect agate from the stories, with a backdrop of whipping wind, flashing torchlight, and the splash of Pouas gaff in the water. But one night, Grandma notices something mysterious. Someone has stolen some stars from the sky. And then the patupaiarehe come out to play on the beach... Can Sam and Te Rerehua rescue the Matariki stars?